It would be very wrong to think that the Omega De Ville Prestige Co-Axial Chronometer 424.13.40.20.01.001 Men’s Watch is just another tribute from the Swatch group to its historical line of De Ville watches. Instead, think of it as a contemporary classic in a timeless design with that vintage feel brought upon full tilt! What started back in the 1960s resurfaced once more, embodying the heritage of the Omega De Ville series, introduced as a part of the Seamaster collection that embodied the true feel of the classic dress watch. The charm of the De Ville has increased over the years and today, it epitomises our idea of being classy, dressy and elegant. Today’s De Ville appeals to a wider market; of consumers who are always in the hunt for interesting designs and variety at a competitive price – a price that’s far too less if the timelessness of the design is to be considered. And that’s just one aspect to it. 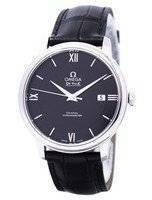 An interesting fact about the Omega De Ville Prestige Co-Axial Chronometer 424.13.40.20.01.001 Men’s Watch is it’s the smallest of all Omega men’s watches. Measuring a pert 39.5-mm across (with crown), it’s still a millimetre and a half larger than the vintage pieces per se. Understated, sleek and vintage-Seamaster-inspired, the De Ville is nothing short of being called appealing and will stay that way even in the days of the future. This is the sole reason that the Omega De Ville Prestige Co-Axial Chronometer 424.13.40.20.01.001 Men’s Watch has now become the brand’s one of the most popular products and stays pure and unaffected, if compared to the classic 1967 styling. But most interesting part of the Omega Constellation Co-Axial 424.13.40.20.01.001 Men’s Watch is perhaps its Co-Axial calibre 2500 movement that was built upon the Omega Cal 1120. The addition of co-axial escapement makes it one of the sturdiest and most reliable of chronometer movements in the entire watch-making industry. For those who want to go a bit deeper, the Cal. 1120 movement is a decorated and fine-tuned version of the ETA 2892-A2 workhorse. The Co-Axial escapement utilises two escape-wheels (with added jewels) that are mounted together and work in conjunction, releasing the torque delivered by the main spring. This results in less friction, since there’s no more of multiple jewels to slide along the teeth of a single wheel; instead, in this case, there are three of them to catch the edge of the teeth on two wheels, resulting in less friction for the escapement and extending the service periods. However, putting all those technicalities aside, the overall design of the Omega Seamaster Professional Diver Prestige Co-Axial Chronometer 424.13.40.20.01.001 Men’s Watch is pure and unaffected classical and its luxurious black leather strap magnifies that feel even more. An elegant version of polish, class and sophistication, if truth be told! This entry was posted in Omega Watches and tagged Omega De Ville, Omega De Ville Prestige on November 4, 2016 by citizenwatches.